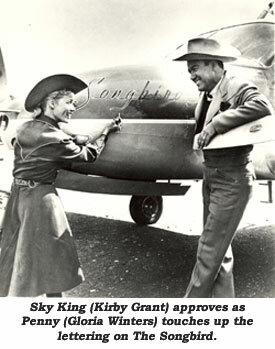 Do You Remember... "Sky King"
America’s Flying Cowboy, “Sky King”, began as a 15 min. Mon.-Fri. serialized kid’s show on ABC radio in October of 1946 with Roy Engel as Sky. By 1947 it was 30 min. twice a week with Jack Lester as the flying rancher. When the show moved to ABC in 1950, Earl Nightingale took over the role, replaced in the final year (‘54) by Carlton KaDell. A very young Mike Wallace was an announcer for sponsor Peter Pan Peanut Butter. 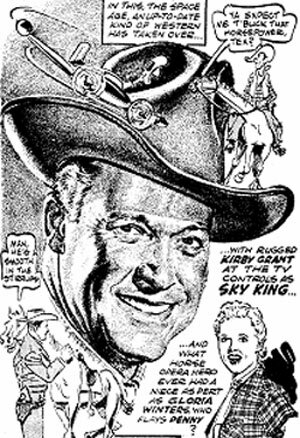 Schuyler “Sky” King, former Navy flyer, came to NBC TV in December 1951 in the person of Butte, MT, born Kirby Grant, who made the role forever his own. After a stint as a Chicago radio singer, Grant went to Hollywood, made a few musicals, then starred in a quick series of B-westerns at Universal and later as a Canadian Mountie at Monogram (w/the dog Chinook). Peter Pan was also the first TV sponsor of “Sky King” at $9,000 an episode. The half-hour contemporary western wandered all over the weekend schedule on, at first, NBC then ABC from ‘51-‘53, before touching down in primetime in ‘53. After Jack Chertok Prod. finished filming 19 episodes, a falling out between Peter Pan and the ad agency halted production on the series, altho reruns continued until production resumed under new sponsorship. 53 more were filmed and shown, along with the original batch, through 1966, including a run on CBS. In the first 19 episodes, 19 year old Ron Hagerthy was Sky’s nephew Clipper, and Gloria Winters, also 19, was niece Penny. Then came the year or so hiatus for the series. When production resumed, Hagerthy had been drafted into the Army. Subsequent plots explained his absence by saying Clipper had joined the Air Force. Winters continued throughout the run of the series. Grant was working as a writer for Wilding Pictures in Chicago, making industrial films, when the decision to resume the series was made. The Arizona rancher patrolled his Flying Crown Ranch near mythical Grover City in the Songbird. In the first season it was a twin engine Cessna P-50. During the later 53 episodes, Sky flew a Cessna 310-B with wing tanks. Over the years, Grant maintained 130 episodes of “Sky King” were filmed, and that many negatives were lost in a warehouse fire, but facts indicate only 72 were actually ever made. 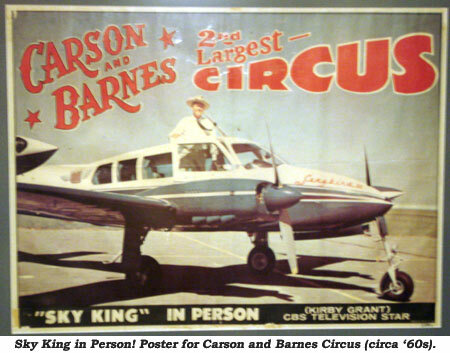 Grant was part owner and star of Carson and Barnes Circus from ‘65-‘70. He operated Sky King Youth Ranch of America in the ‘70s, then worked in public relations at Sea World in Florida. Kirby died in a one car accident in Florida in ‘85 at 73 as he was driving to Kennedy Space Center to watch the launch of the ill-fated Challenger space shuttle. Aerial footage on “Sky King” was handled by aviation instructor/stuntman Paul Mantz, a one time advisor to aviatrix Amelia Earhart. Grant once told me, “Some of that hairy flying; he made me look awfully good.” In ‘61, Mantz teamed with fellow movie stunt pilot Frank Tallman and formed Orange County Airport-based Tallmantz Aviation. Chubby Johnson played Flying Crown ranch foreman Jim Bell in early episodes. Johnson died in ‘74 at 71. In much later episodes, two juveniles played young friends of Sky and Penny. Terry Kelman was Davey, Gary Hunley was Mickey. Kelman was later in “Bus Stop” and “Kathy O”. Hunley appeared in “Carnival Rock” and “Legend of Tom Dooley”, but nothing has been heard from them since.